Our church has an annual Advent friends program where we get another family as our secret Advent friends and give them a gift each week of Advent and then a final gift at a wrap up party on Epiphany ( this year January 8). As I was trying to decide what to do for that final gift my scrappy trips lotto winnings were calling to me from the design wall. Our friends are a mother and her 5 year old daughter, so I thought decided mother daughter quilts would be good. I sorted blocks and came up with arrangements I liked and then started prepping blocks for sewing together. I discovered size discrepancies of as much as 1/2 inch and so I decided to just trim all the blocks down to the smallest size and add sashings so I wouldn’t need to try to match seams. The tops are now done and I will begin quilting tonight. I still have a few blocks left which will be used in donation quilts. Edited by Sophie to add cropped photo for gallery/home page. These are gorgeous…and what a great gift to end the Advent season on. How kind of you! They look wonderful. Wow, what a great idea! I bet they'll be so happy! They turned out wonderful. I love them. Wow, you sure moved on these. Both are fantastic and a very sweet gift! 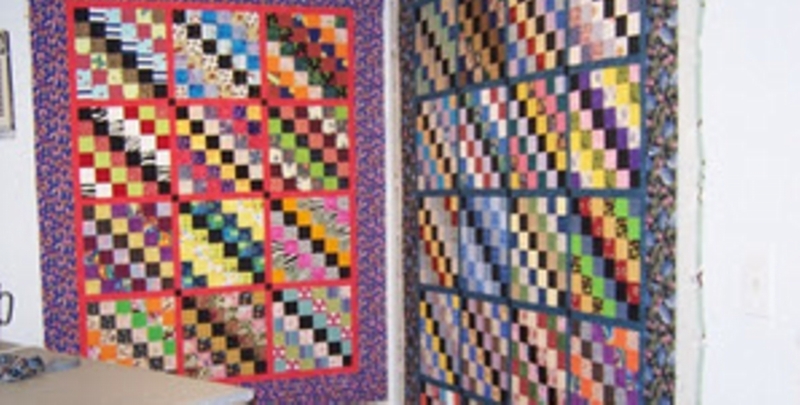 The 2 quilts are beautiful! What lovely gifts – very lucky mom and daughter.